Well said :) keep going - lovely blog! Absolutely fantastic! I bloody hate trolls and have seen some very persistent ones lately. Keep on going - the stronger person will win out! Please carry on and ignore the trolling which I can appreciate is demoralising and hurtful. I really don't understand why people feel the need to bring others down. Great post which I shared with some friends. WE LOVE YOU ANNA. And troll... please don't waste any more of your life existing in the toxic invisibility cloak you have created for yourself... The real world's actually not that bad. You should try it! Well done!!! Thank you for putting yourself out there! You're rocking it! I have been reading your blog for a while now and have never commented but felt I had to- just to tell you that you blog is fab, I get lots of ideas from it. Please ignore those trolls. They are not worth your time. However, I also applaud you for standing up to them and calling out their unacceptable behaviour. Hope you day gets better after this. As another long-time reader who hasn't commented before, I really wanted to say "this is great stuff and keep up the good work". I love your blog and the trolls are a sign of its success - they tend not to waste their time commenting where very few people will see it. They're just deeply insecure sad little people who can only engage anonymously and negatively. Probably more deserving of your pity than anything else! Keep writing real, inspiring, fun posts. These are exactly the reasons why us "normal" girls read and enjoy your blog so much! I'm so sorry you've had to put up with this because I love your blog and fashion sense, and I for one think you have an amazing figure! I commend you for standing up for yourself and broadcasting that 'trolls' do exist within blogging. And I'm glad it won't hold you back in the future; keep going with your blog because there's so many more of us who love it! oh no you didn't! Love your blog - don't let the haters get to you! I look at your blog every day - it's in my top three. I think you have a fantastic sense of and you're very pretty. The photos of you in SA were perfect, natural and show that you have a lovely figure. I'm glad that your response to the troll was an honest heartfelt one. Bravo! Well done, Anna for having the courage to speak up. You've done it such grace too. You said what most of us who have been in similar situation have failed to do. I've found heaping abuse just fuel the fire but killing them with kindness and compassion snuff out residual anger quickly. And I thank you trolls, for boosting my page views! Sadly, these people exist (I get one who comments continually on my wonky teeth, when I wore braces for years) but at the end of the day, they're probably writing a blog that no one reads and can't understand why yours is successful. And yours is: because you are a NicE person! Honestly, I wouldn't mind waking up looking like you, you've nothing to worry about at all in the looks department. Well done for writing this Anna, I experienced my first troll comment on my blog this week and at first I was really shocked because I've never had anything but nice genuine comments before. A few fellow bloggers told me to delete it but I was pretty adamant that I wanted to reply. Like you I felt strongly that a bully without a name or a face should not be aloud to make me feel that way. So far I haven't had anything else but I really admire you for tackling this one head on. Please don't take anythibg they have said to heart, personally I can't believe you have any self confidence issues, I read your blog and am always so jealous of your ability to look good in every photo you take, when I have to take about 50 just to get one that looks half decent! 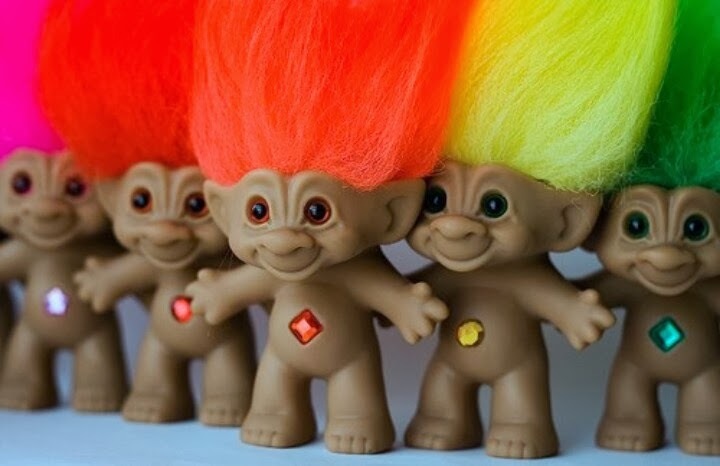 Love your blog and you always look gorgeous so just remember that for every troll there are thousands of genuine readers who appreciate your content! Anna, this is a great article and I think anyone who's exposed their face and opinion to the internet crowd must have received the visit and comments from these trolls. As a lot of comments above said, it is jealousy. But it still hurts and gets to you. I feel you a 100% and want to make it clear: this blog rocks ! WE LOVE YOU MISS. HART! Awesome post - well written and thoughtful. I haven't seen you for ages but I love your blog and read it religiously and love seeing the different outfits you can pull off - I wish I could! I pointed this article out to my husband last night and his comment was - "they were rude about her - but she is HOT!!" So there you go! Another regular reader here never comments - this is a fantastic blog, you have brilliant style and a lovely figure. Please don't take the comments of one or two sad, lonely little idiots to heart (although I appreciate that's easier said than done) as you have an army of admirers who love your writing. I am so sad to hear that you've had to deal with such nastiness! I'm a big fan of your blog and find it such a great help when navigating the world of fashion. Your figure is nothing like a bowling pin. You are beautiful, slim and feminine. Personally I think all the clothes you blog about look better on a normal person than on stick-thin models. Also I looked at the three posts that you linked to, and it is quite beyond me what is wrong with anything in those pictures. Thank you for being brave enough to share your photos with us, even if you don't always love them. There's something quite beautiful about having the courage to be vulnerable. I am so sorry that some very unhappy person has seen fit to write malicious comments on your lovely blog. They must be very bored and miserable to take out their angst on an unknown blogger. I loved your response, I love your blog and you always looks amazing - thanks for sharing and please carry on blogging! Trolls really are just losers - I don't even have a blog or anything like that(still busy learning how to dress myself from others - really not one to be giving any kind of inspiration) and I got an anonymous message to my twitter - which is private with about 100 followers - telling me I was fat and should lose weight recently. Such a weird thing to even have to think about and definitely something better ignored! Just read your post, I love your blog! And I always think how fabulous you look! Don't let a bully get you down, shame shame shame on them whoever they are... Please keep up the good work! The best response to trolls I think I've ever read. Big bravo to you for admitting what we're all very nervous of saying- that it isn't water off a duck's back. Nasty comments, whether online or in person, can cut deep, especially if they highlight something you're already conscious of. I always wonder why it is that someone takes pleasure in that, and I still haven't come up with a decent answer. Its a very messed up mentality to enjoy bringing someone down. Anyway, you're a babe Anna,and in more ways than just your appearance. What Susie says of Sally says more of Susie than of Sally, remember that. Keep going girl! I just re-read this again and am genuinely touched by your frankness, Anna. Having known you through our awkward teenage years(!) I can see what a successful and brave woman you have become.